Water Bottle is in stock. We will print it as soon as you order it. 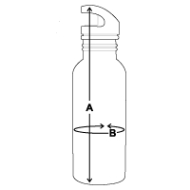 Bring this water bottle with you to the gym, strap it to your bike, or carry it along to the beach or work. Take your favorite beverage with you wherever you go with this convenient, customizable container. Think of all the money you’ll save on bottled water and how good you’ll feel being so environmentally conscious! Made of aluminum and plastic | Volume: 20 fl. oz. My grand daughter loves it. It does a good job of keeping her water cold for her softball games and that is important. Perfect watet bottle for my son to bring in school, He likes the the design, fits perfectly in he’s lunch bag. *** having issues w/ “How well does the product fit selections”, it wont let just pick “PERFECT”, everything is lighting up. But overall its a great product.